Living Law presents a comprehensive overview of relationships between legal and social theory, and of current approaches to the sociological study of legal ideas. It explores the nature of legal theory and sociolegal studies today as teaching and research fields, and the work of many of the major sociolegal theorists. 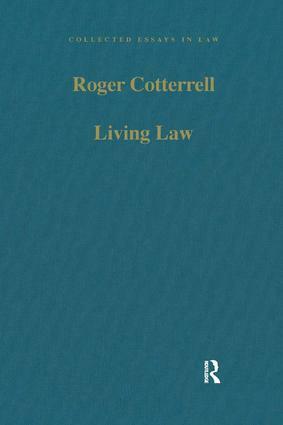 In addition, it sets out the author's distinctive approach to sociological analysis of law, applying this in a range of studies in specific legal fields, such as the law of contract, property and trusts, constitutional analysis, and comparative law. Contents: Introduction; Part 1 The Scope of Legal Inquiry: Subverting orthodoxy, making law central: a view of sociolegal studies; Community as a legal concept? Some uses of a law-and-community approach in legal theory; From 'living law' to the 'death of the social': sociology in legal theory; Pandora's Box: jurisprudence in legal education. Part 2 Sociolegal Theory and Theorists: Living law revisited: communitarianism and sociology of law; Emmanuel Lévy and legal studies: a view from abroad; Durkheim's loyal jurist? The sociolegal theory of Paul Huvelin; The rule of law in transition: revisiting Franz Neumann's sociology of legality; The representation of law's autonomy in autopoiesis theory; Images of Europe in sociolegal traditions. Part 3 Interpreting Legal Ideas Sociologically: The development of capitalism and the formalisation of contract law; The law of property and legal theory; Some sociolegal aspects of the controversy around the legal validity of private purpose trusts; Trusting in law: legal and moral concepts of trust; Some aspects of the communication of constitutional authority; Comparative law and legal culture. Part 4 Law Morality, Community: Common law approaches to the relationship between law and morality; Legal effects and moral meanings: a comment on recent debates on approaches to legislation; Ideals and values in law: a comment on The Importance of Ideals; Culture, comparison, community; Lawyers and the building of communities; Name index.